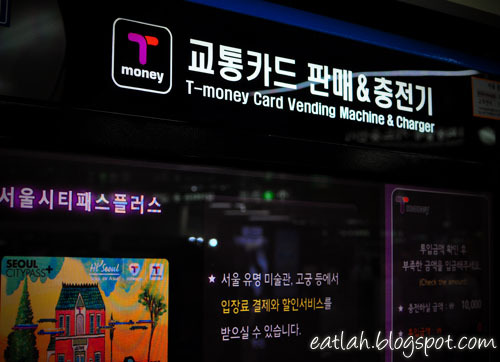 Getting around Seoul with T-Money Card | where and what to eat lah? 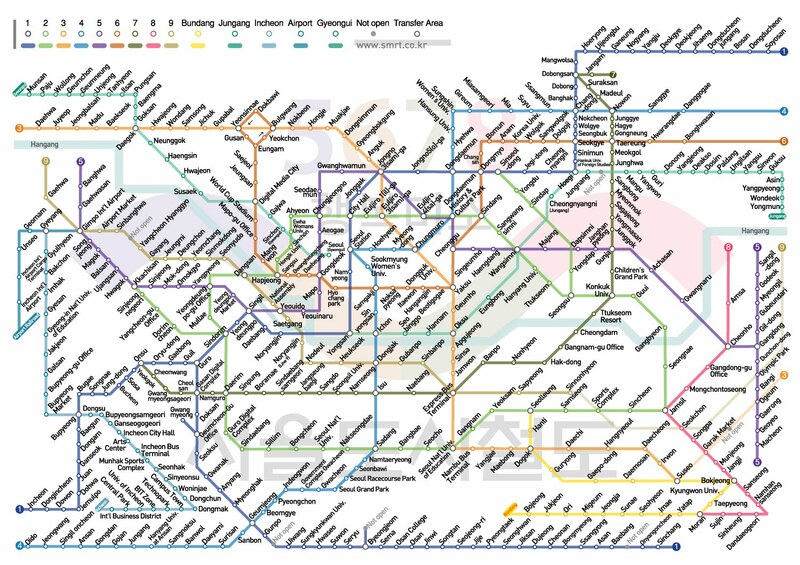 One of the best way to get around Seoul is the subway (지하철 jihacheol). Don't be nervous and intimidated by the complexities of the subway networks when you are doing self-guided sightseeing, it isn't that difficult once you have tried it. For tourists like us, we used the subway extensively and the most convenient way is to get a T-Money Card. The T-money card is like a prepaid credit card that can be used on any subways, buses, some taxis or even public telephones, convenience stores and some vending machines. Besides being ultra-convenient, the T-Money card also gives you discounts off the cash fare. If you use the subway a lot, those savings add up! 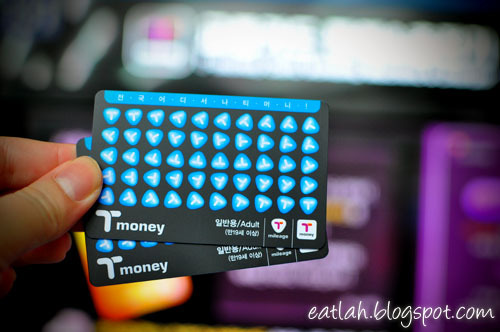 Where can I buy a T-Money card? You can buy it from any subway station counter or any convenience stores like GS25, Family Mart, 7-Eleven and MINISTOP that have the T-Money sign displayed. It only cost KRW 2,500 (RM 7.13) and you will need to add money to the card before using it. How to recharge a T-Money card? The easiest method for us is via the ticket vending machines. If you are technically challenged, you can always buy the credit from the convenience stores or subway ticket counter. You don't really need to speak Korean – just hand them your card and the cash amount you wanted to add. The vending machines operate in either Korean, English, Chinese or Japanese. Just select your language preference and the rest of the menu will be in the selected language. Touch the T-Money card icon on the right side of the screen. Place your T-Money card on the electronic card reader marked with the T-Money logo. Select the cash amount you wish to add to your card. Place the money into the machine. Wait until the recharging process is completed, and don't forget to take the card with you. How do I use the T-Money card? Simple! Just scan your T-Money card on the card reader on your way in and out of the subway. The display will show you how much has been deducted from your card and the current balance. Why use a T-Money card? It's really convenient and save up your time queuing up for a ticket. 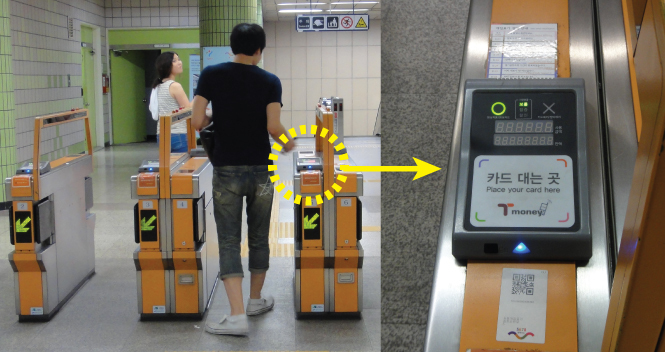 The base transit fare for a T-Money card passenger is KRW 800 compared to a normal ticket KRW 900. You get a 10% bonus whenever you top up your card. If you recharge KRW 10,000, you will actually have KRW 11,000 added to your card! Can I get a refund for the remaining balance? T-Money cards have no expiration date and the unused balance will remain on your card until the entire amount is used up. You can receive a refund for the balance on your card at convenience stores like GS25 that charges KRW 500 (RM 1.43) fee and the card price of KRW 2,500 is not refundable. Even though you have taken a general seat, it is common to give up your seat for an elderly rider as the Korean culture emphasizes on respecting the elders. Residents in Seoul aged 65 and older crossed the 1 million mark and that accounts for 9.7% of all 10.31 million Seoul residents. Yes, the subway is packed with elderly citizens! Korean culture tolerates a higher degree of incidental pushing and without needing to apologize every time you bump into somebody. As such, subway-riding Koreans might be a bit aggressive to certain tourists. Don't sweat it, it's the culture! Most of the Koreans have the ability of walking through hordes of people while staring only at their phone. Try not to use your T-Money card on taxi. There is a possibility of meeting a less honest taxi driver that scanned your card but telling you that it isn't working somehow. Hey! I simply want to give an enormous thumbs up for the great information you have got right here on this post. this post. I shall be coming again to your blog for extra soon. Do you individuals have a fb fan page? I appeared for one on twitter however could not discover one, I would like to become a fan! on this post. I might be coming back to your weblog for more soon. information you may have here on this post. Hello! I simply would like to give a huge thumbs up for the great data you’ve right here on this post. Hello! I simply wish to give a huge thumbs up for the nice information you will have here on this post. again to your blog for more soon. info you’ve here on this post. I can be coming back to your blog for more soon. great information you will have right here on this post. the nice data you have right here on this post. I can be coming back to your weblog for extra soon. for the great info you’ve here on this post. a very interesting game to Ьe played by both of you and your man will love this more than anything else. But perhaps you can never believe, now, that there is anything human in my heart.